Sam Shepard’s “A Particle of Dread (Oedipus Variations),” his final work, is something of a bewildering experience. 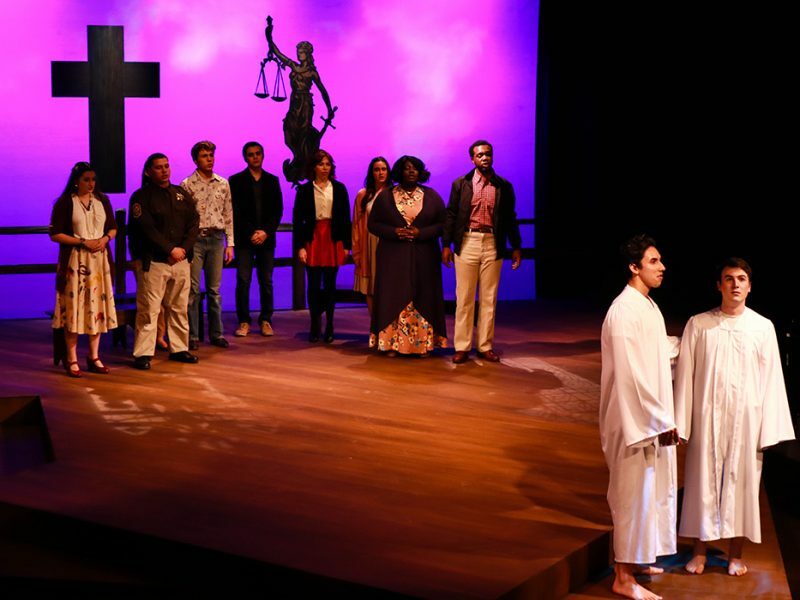 The play is best appreciated, I think, by two groups: stalwart fans of the playwright; and people who are very familiar with the classic Greek tale of Oedipus, which Shepard intertwines with a modern-day retelling of the narrative. By the conclusion, the old and new versions have tangled into a strange and nearly incomprehensible knot. The new Fresno State production, which continues through Saturday, Oct. 7, is stylistically ambitious and earnestly presented. It’s also a nice dedication to Shepard (known for such classics as “Buried Child,” for which he won a Pulitzer, and “True West”), who died just a few months ago. But the production also can feel sterile and fussy, as if it’s daring the audience to keep up with its intellectual games. There’s a lot to unpack in the premise. Oedipus — whom the playwright Sophocles immortalized — is the baby famously prophesied to one day kill his father and marry his mother. Such a horrific human tragedy would seem to be a calamity we can safely relegate to ancient times, you’d think. We’re much too “civilized” today to entertain such possibilities. But Shepard doesn’t want to keep such messiness in the past, it seems. He builds on the Oedipus tale by moving it from Greece to the contemporary desert environs of Barstow (yes, in California), with an alternate set of characters. Oedipus becomes Otto (both played by a restrained and sturdy Steven Weatherbee). Jocasta, the mother and wife of Oedipus, played by Ruby Arreguin, becomes Jocelyn. Antigone (Thuy Duong), the daughter of Oedipus, is Analee in the contemporary version. Oedipus’ father, Laius (Anthony teNyehuis) — who in the Sophocles version binds his son’s feet with a pin and orders his wife to kill him — becomes a contemporary mobster named Langos. But other comparisons are more wobbly. As the action of the play flits between the past and present in non-linear style, anomalies between the two tales are more apparent even as it becomes harder to figure out which time period we’re in. (I don’t know if that’s an issue with J. Daniel Herring’s direction or a deliberate conceit used by the playwright — but, heck, there’s a lot I’m unsure of in terms of this play.) Are we watching the Antigone character in the modern-day tale trying to leave her son on a mountainside? Or is she back in ancient times? But could either scenario even be possible, considering that Antigone in the ancient tale wouldn’t even have been born yet? Why, too, does the Oedipus character recognize his father in the play’s modern-day depiction of regicide when the opposite is true in the Greek version? Is the playwright just playing with us? This surrealist tinge puts us firmly into Shepard territory, and such discrepancies are obviously intended, perhaps to show how the whole idea of narrative is an inherently slippery concept that can’t help but be altered with the passage of time. Another interpretation might be the idea that the modern version of Oedipus is able to use his free will to alter his own story. I tried to shift my focus as an audience member to let the world of the play enfold me, to skip the mental gymnastics and try to absorb the visceral impact of the play. But I couldn’t. I spent my time trying to track the Oedipus story and piece together the modern equivalent. I felt like I was treading water. The creative team constructs a world of white and red, to better highlight the blood. Kristine Doiel’s costumes have a bright-white impact with splashes of red, which sometimes works (a cape for Laius) and sometimes doesn’t (a double-breasted white jacket for Langos that feels forced). Regina Harris’ lighting design is more effective, adding mood and nuance, as is Liz Waldman’s sound design, which peppers the production with a crackling, dripping intensity. My favorite performances are from Arreguin and Duong, who connect equally well with their classical and contemporary characters. Kat Campos is strong, too, as the “Maniac of the Outskirts,” a homeless character who pops up now and again to comment on the action and (again, I’m speculating here) serve as a reminder that the disenfranchised will always suffer, no matter the era of human history. And much of Herring’s direction is seamless and assured amidst the carnage, with a powerful stage picture created of a hanging, for example. But in the end, I couldn’t connect either intellectually or emotionally with “A Particle of Dread.” In Shepard’s deconstruction of the nature of tragedy, he skimps on one of its key elements: catharsis. 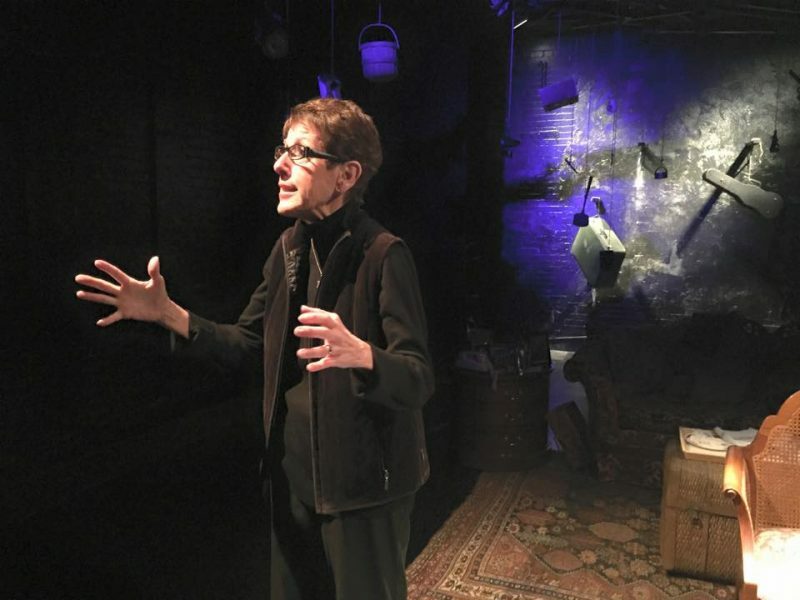 At one point Duong’s character, in an aside to the audience as she speculates on the point of sitting in the theater watching tragedy unfold, speculates “What’s in it for us?” In the case of Shepard’s final play, I couldn’t really think of a good answer. “A Particle of Dread (Oedipus Variations),” runs 7:30 p.m. Wednesday, Oct. 4-Saturday, Oct. 7, Dennis and Cheryl Woods Theatre, Fresno State. Runs through Oct. 7. $17, $15 seniors, $10 students. Donald, your points are exactly what I believe Sam Shepard intended for an audience to ponder and reflect on for many days following their viewing of A PARTICLE OF DREAD. Thanks for your reflection. We all need to look at the man/woman in the mirror from time to time. I had trouble following this. The double character portrayal (ancient v modern) really had me wondering who did what to who? If I had not read the synopsis of the story beforehand I would have really been lost. I enjoyed the set and J. Daniel’s artistic dramatization is always a treat! I also thought the acting was amazing!